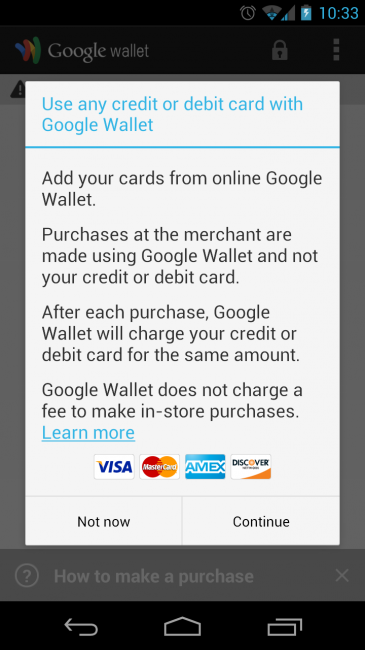 Google announced this morning that Google Wallet will now accept any debit or credit card to be used when making mobile payments, including Visa, MasterCard, American Express, or Discover. Their approach has changed, meaning they now store your cards on secure Google servers, rather than in the secure element of your phone. This should speed up the process for banks to make their cards available to the service. Along with this massive change, they are also allowing you to remotely lock your Wallet app on a stolen or lost device. You can visit the online Google Wallet site which should list out your active devices. Once disabled, the device can no longer make purchases or participate in transactions. When you first login to the new app, it should ask if you would like it to import your stored cards that are currently used through your Wallet account in Google Play. From what we can tell, this move still hasn’t made the app available to Verizon phones. Update: If you cruise into the comments, you will likely find the .apk to download directly to your Verizon NFC-enabled phone.